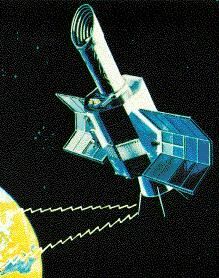 American ultraviolet astronomy satellite. Astronomy (UV) satellite built by NASA GSFC for NASA / ESA, USA. Launched 1978. AKA: International Ultraviolet Explorer.. Status: Operational 1978. First Launch: 1978-01-26. Last Launch: 1978-01-26. Number: 1 . Gross mass: 672 kg (1,481 lb). Family: Astronomy, Geosynchronous orbit, Ultraviolet astronomy satellite. Country: USA. Engines: Star 24. Launch Vehicles: Thor, Delta, Delta 2914, Delta 2000. Launch Sites: Cape Canaveral, Cape Canaveral LC17A. Agency: NASA. Bibliography: 2, 279, 3814, 3815, 6, 11248, 12700.